1. What type of app are you creating? Do you want to make a web app, a desktop app or a mobile app? To help decide what you need, ask yourself who will use the app? Is it just for your use or do you plan to distribute it? It may turn out that a desktop app is better than a web app because the app will be used offline. Maybe a web app is better because it will be much easier to deploy and update to all your users. Maybe the app needs to be used “in the field” and mobile is the way to go. 2. Do you need cross-platform support? Does your app need to run on your Mac and an iPad? Do you need to share it with a co-worker who uses Linux? These days people often use multiple devices, so it can be a competitive advantage to have an app that runs on more than one device type. If so, consider a tool that makes it easy to create apps for multiple platforms. Using a cross-platform tool can be a lot simpler than learning to develop with multiple tools to create all the apps for all the platforms you need to support. Also consider the platform you want to use while developing. Some tools will let you develop from any platform, but not all do. 3. 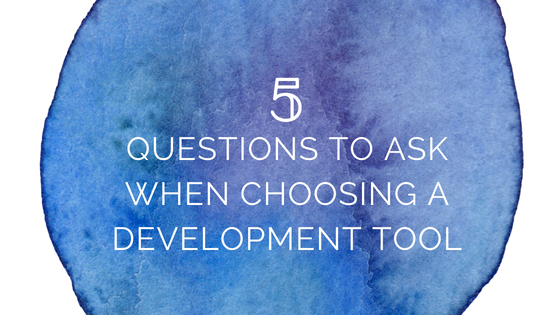 Are you already familiar with a development environment or tool? Perhaps you did some development many years ago or took a class back in college. Also, if you are tackling this project for your job, find out why current tools are being used at your workplace. Is it because of cost, inertia, standardization? Although you may find you have to use a specific development tool in the office, many companies simply prefer that problems get solved quickly. In that case, look around at tools that can help you create rapid (RAD) solutions while still being compatible and supportive of the required development tools. 4. How experienced are you? Have you created apps before? Consider your skills when picking your tool. Some tools can be amazingly complex. Perhaps you are creating a simple app for yourself or just your department, you may not have the time to master all the intricacies of Java and its related tools. 5. What resources and learning materials are available? Does the tool you want to use have the resources in place to help you build your app? Review the documentation, look around for videos, articles, books and forums that can offer support. Webinars can also be a great way to quickly learn about a tool. Of course, we think Xojo is a great fit for a wide variety of apps. With Xojo you can quickly build apps for Windows, macOS, Linux, Raspberry Pi, web and iOS – with Android support currently in development too. Xojo may not be as well known as the other tools you are considering, but we’ve stood the test of time; and Xojo is consistently updated and supported.